This post is sponsored by Krusteaz®. Tailgating season is in full swing and I wanted to share a game day spread I put together, along with two tasty recipes I came up with using Krusteaz® cornbread mixes (thanks to Krusteaz® for providing the “game day” spread ingredients and supplies!). The photo above shows the Cornbread Sausage Balls and the photo below shows the Cheesy Chili-Cornbread Bake. The two mixes I used were Krusteaz® Honey Cornbread and a great new flavor, Fire Roasted Cornbread. This entry was posted in Appetizers/Snacks, Autumn/Thanksgiving, Breakfast/Brunch, Entertaining, Food and Recipes, Main Dishes and tagged Chili, Cornbread, cornbread chili bake, Cornbread muffins, cornbread sausage balls, game day food, sausage balls, tailgating on November 8, 2018 by nancyc. Here’s an easy recipe I made with Nasoya® Won Ton Wraps. I had never used these wraps before, so I was interested in trying them out when I was offered some complimentary product from Nasoya® (they also provided a gift card to cover the cost of other ingredients). I decided to try a dessert-like recipe from their site called Cannoli Cups and I also created my own recipe for an appetizer, which I’ll share with you in my next post. If you’re not familiar with these Nasoya® wraps, they are all-natural and super easy to use! You can find them in the produce section next to Nasoya® tofu and other products. 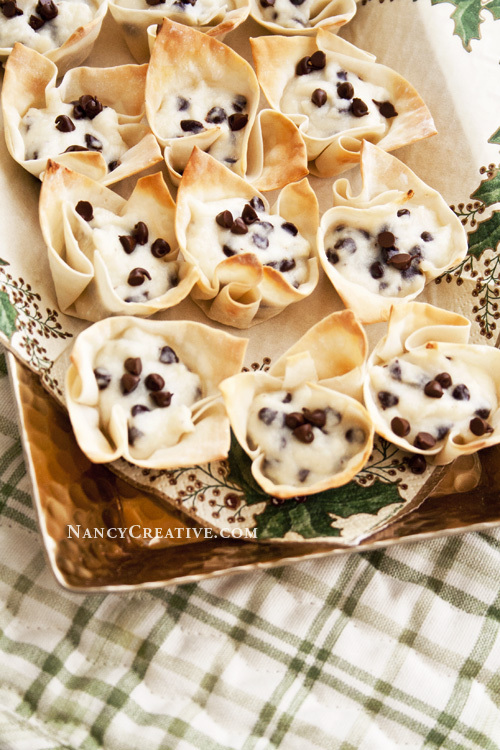 I made my cannoli cups a little differently from the original recipe, making them mini-size. I also added way more chocolate chips than the original recipe–actually by mistake! For some reason I thought the original recipe called for 1 1/3 cup mini chocolate chips (it only called for 1/3 cup), so I started off adding 1 cup and mixing it into the ricotta cheese mixture before catching my mistake! But it was one of those happy mistakes, because the lightly-sweet creamy ricotta filling in these cannoli cups taste great with all those chocolate chips! And the won ton wraps make a nice little shell for this yummy filling. This recipe calls for 1 package of Nasoya® Won Ton Wraps and each 12-ounce package has about 52 wraps in it–this recipe will fill up just about all those wraps so it’s great to make for parties and other gatherings! Place the ricotta cheese in a medium size mixing bowl. Stir or beat with a mixer on medium for about 2 minutes, until cheese is smooth and creamy. Add in the powdered sugar and blend well, mixing or beating until smooth. Stir in the chocolate chips, then place in an airtight container in the refrigerator until ready to use. Preheat oven to 350˚F. Place each won ton wrap in the base of a mini cupcake pan, pressing down to create a mini bowl. Bake for 5 minutes, then remove from oven and fill each cup with a slightly heaping 1/2 Tablespoon of filling–then return to oven for 4 to 5 more minutes, until the cups are lightly browned. Remove from oven and let cool slightly, then put on serving plate and sprinkle tops lightly with additional mini chocolate chips. Serve warm (if serving later, keep refrigerated until ready to serve, then warm them in the microwave). I prefer these warm, but you can also serve them at room temperature. These Mini Cannoli Cups are perfect if you’re wanting to serve something sweet and bite-sized. The other recipe I made with these wraps is a savory appetizer that I’m sure you’ll love, so look for it in my next post! 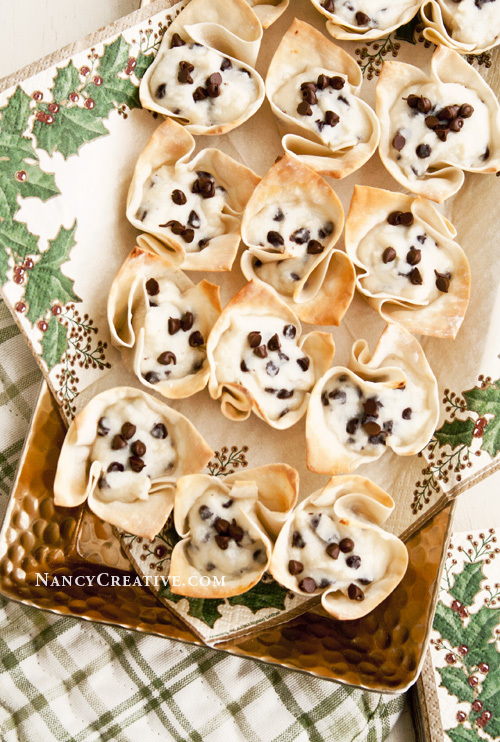 This entry was posted in Appetizers/Snacks, Entertaining, Food and Recipes, Other Desserts, Pies, Tarts, Cobblers, Seasonal, Winter/Christmas and tagged mini cannoli cups, mini chocolate chips, Nasoya, ricotta cheese, Won Ton cups, Won Ton Wraps on December 17, 2014 by nancyc. Now that the weather is warming up, I’ve been eating more fruit–there’s something about the warmer weather that makes me crave it more! I love all kinds of fruit and that’s what I like about this Mango-Jalapeno Salsa–there’s a nice variety of fruit–mango, pineapple, and apple–mixed in with some diced tomato and red bell pepper. It’s a little on the spicy side, so use half the amount of jalapeno and ginger if you want a milder salsa. Overall, I think this is a great, healthy mix of naturally sweet and savory flavors! Speaking of healthy, this recipe is from a new cookbook out last month, The Daniel Plan Cookbook, by Pastor Rick Warren, Dr. Daniel Amen, and Dr. Mark Hyman. It’s a companion book to the New York Times Bestseller, The Daniel Plan: 40 Days to a Healthier Life and has 100 easy recipes (with full-color photos) to help you eat healthy for life. “Food truly is medicine,” says one of the authors, Dr. Hyman. Eating real, whole foods can help reverse chronic disease, aid in weight loss, and even optimize brain health. In developing the book, the authors thought about what most people like to eat, then created healthy versions of popular dishes to show that healthy eating is possible in the “real world.” So there are recipes for Blueberry French Toast, BBQ Chicken Pizza, Spinach and Artichoke Dip, Classic Meatloaf, and Chocolate Coconut pudding, to name a few…that just goes to show you don’t need to feel deprived when you’re eating healthy! I received a sampler of recipes from the book and decided to try the Mango-Jalapeno Salsa. This tropical-style salsa goes well with Mexican recipes using fish or chicken, like the Grilled Spicy Fish Tacos, another delicious-sounding recipe in the book. I really like it with those blue corn tortilla chips, too. Place salsa ingredients in a bowl. Mix together well. Chill in refrigerator. (Keeps up to 1 week refrigerated). This makes about 3 1/2 cups of salsa. It’s really easy to make and so good! Have you tried making a fruity salsa before? This entry was posted in Appetizers/Snacks, Entertaining, Food and Recipes, Fruit, Healthy Eating, Healthy Living, Spreads and Dips and tagged Apple, Cilantro, fresh ginger, Jalapeño, Mango, pineapple, salsa, The Daniel Plan Cookbook, Tomato on March 25, 2014 by nancyc. 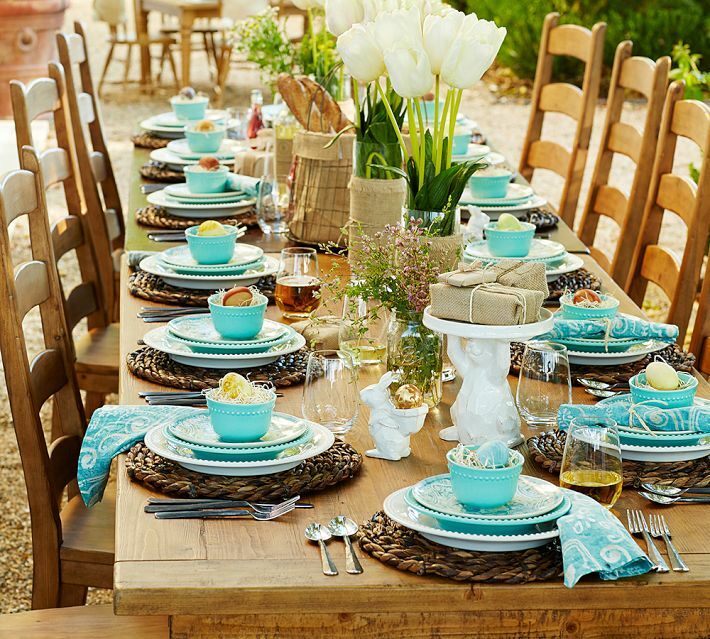 At Pottery Barn, I loved all the teal in the table settings displayed right by the front entrance. 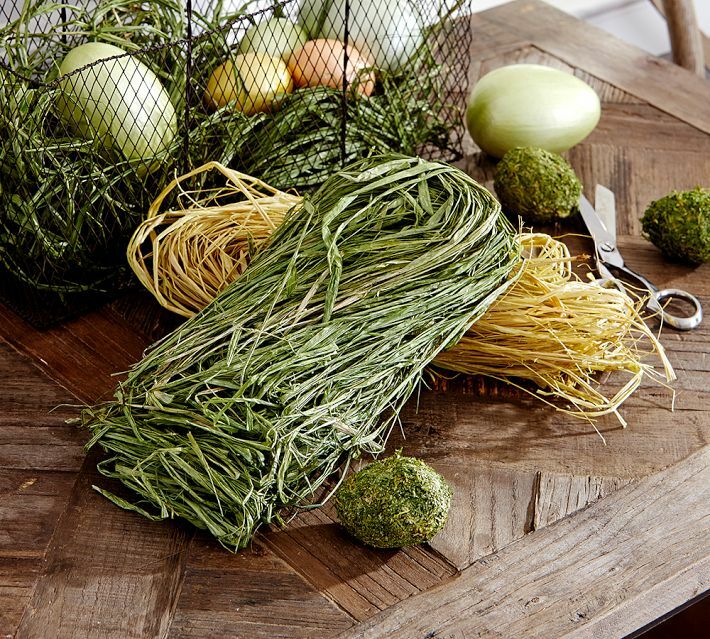 The tableware looked great with the natural color and texture of woven place mats, along with some burlap and twine accents–so springy and outdoorsy! 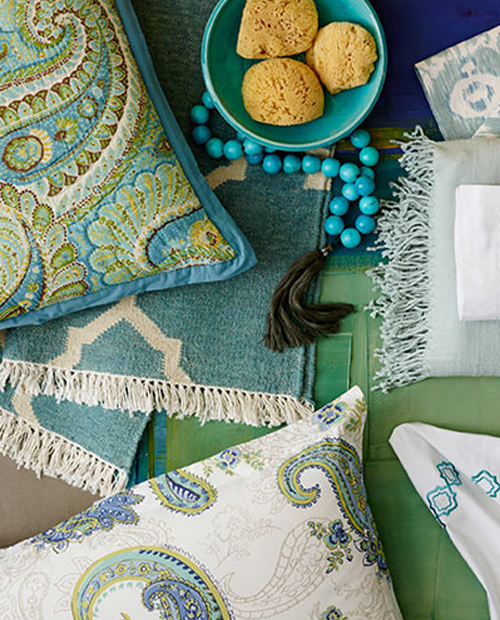 The inside store display I saw looked very much like the set-up in the photo above, featured on the Pottery Barn website. 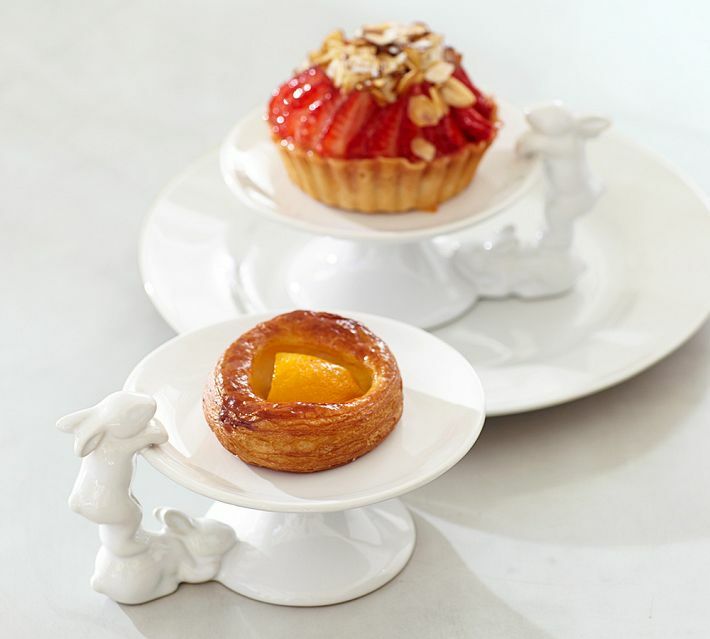 And I thought these bunny cupcake stands were sweet–they also work great for mini pies and tarts or cookies! …perfect for creating your own woodland baskets! 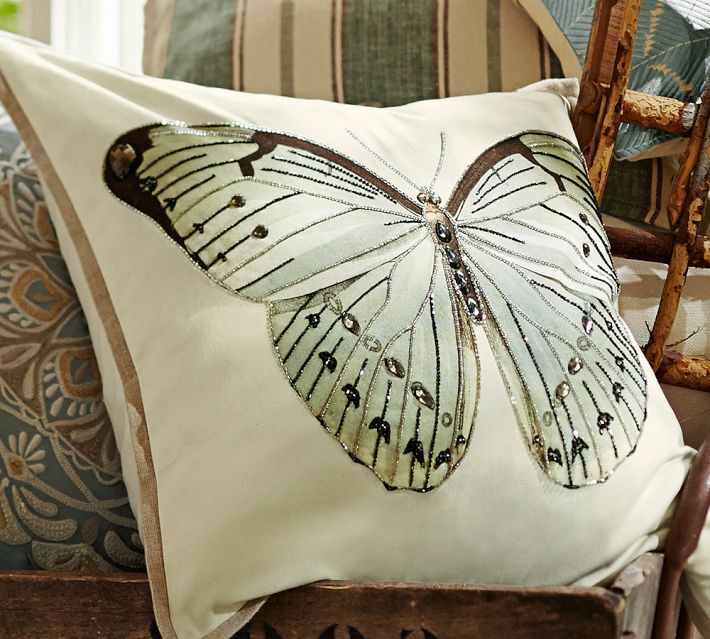 I thought this embroidered butterfly pillow had a great spring feel, too. 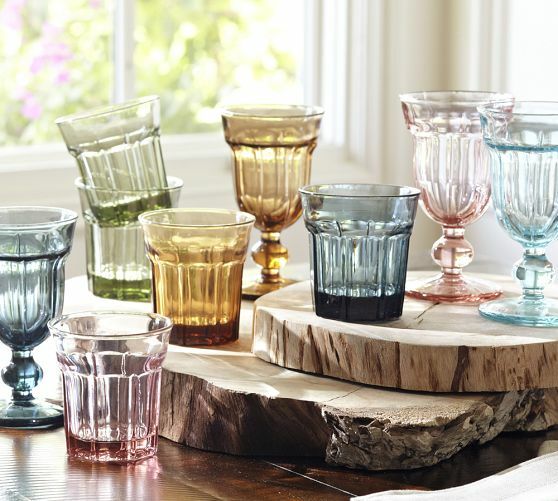 And I loved all the glassware in spring colors, especially the teal! 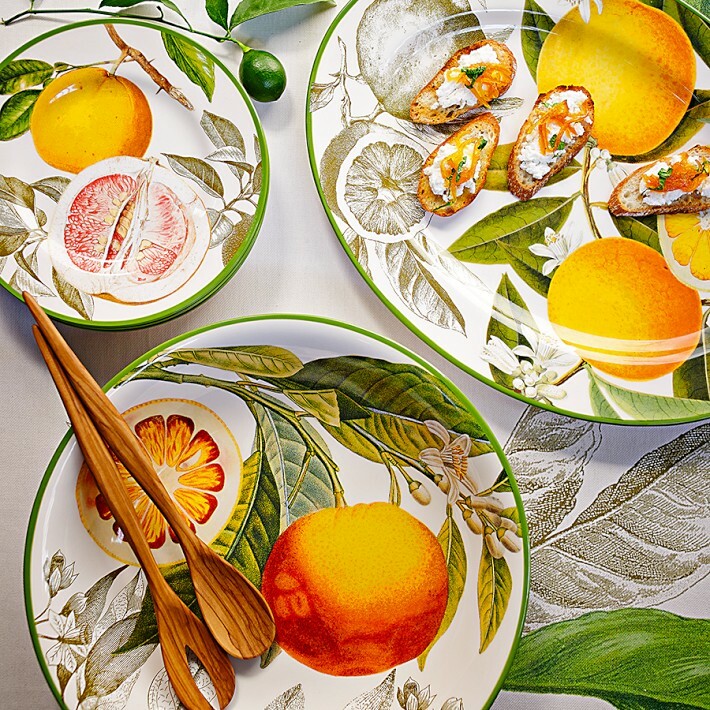 …and they have a new Botanical Citrus Collection which looks very springy. 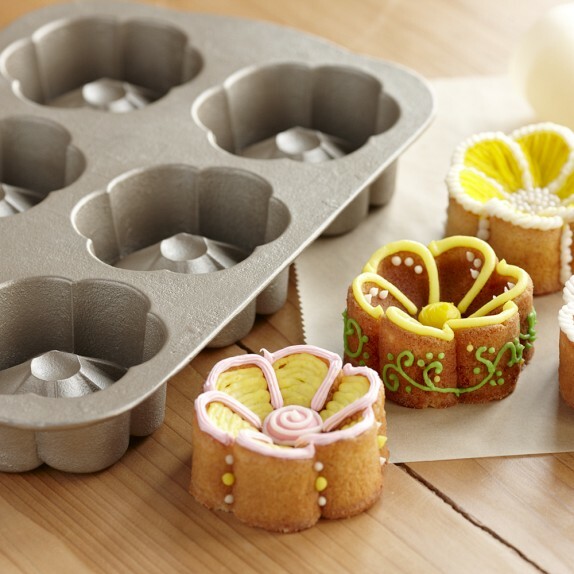 You can always find fun baking accessories there, like this Buttercup Cakelet Pan. How cute is that? 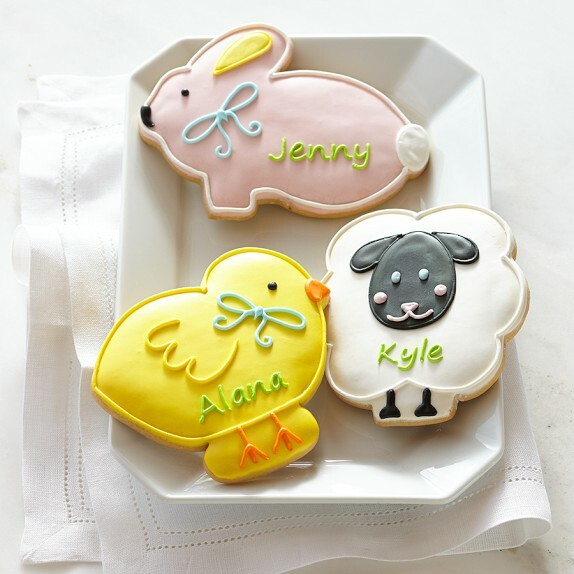 And I saw these cookies later on their website–some great Easter cookie decorating inspiration! 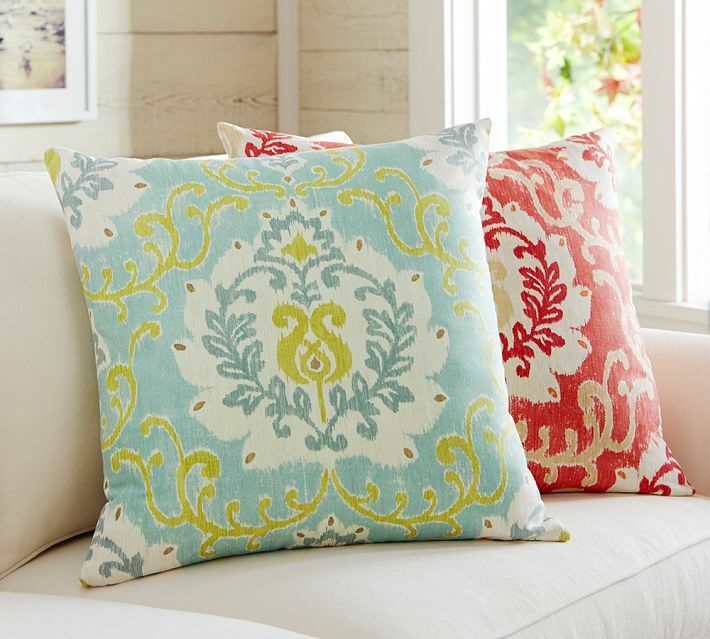 Do you have Spring Fever like I do? 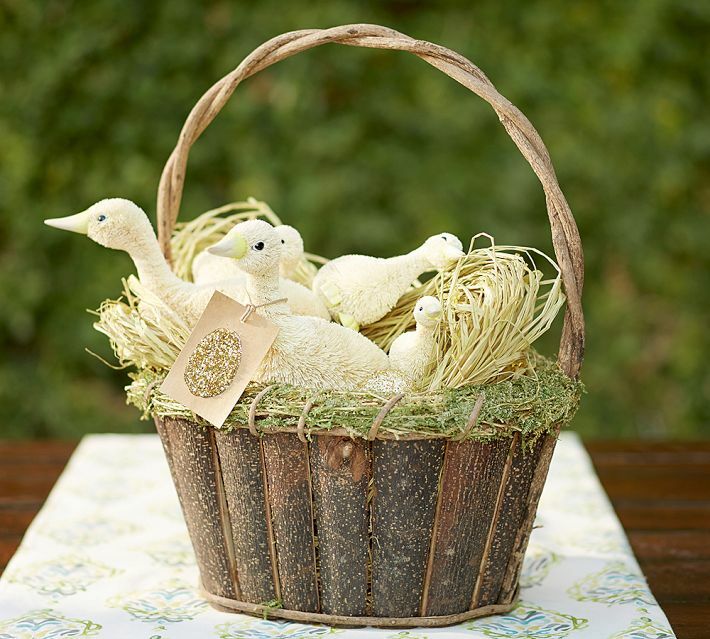 Have you found any inspiring Easter and Spring decorating, entertaining, or gift ideas out there? 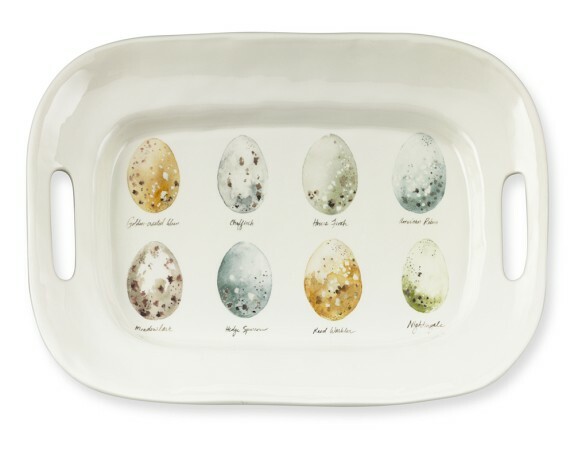 This entry was posted in Cookware, Creative Inspiration, Decorating Ideas, Entertaining, Food Presentation, Seasonal, Spring/Easter and tagged decorating, Easter, Pottery Barn, Spring, tableware, teal, Williams-Sonoma on March 7, 2014 by nancyc.